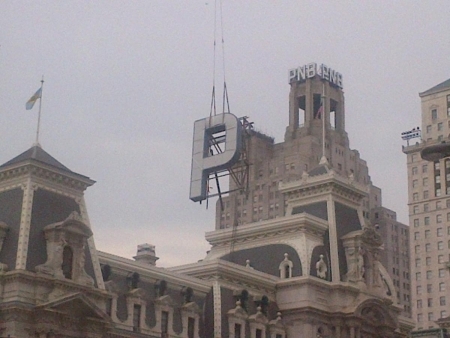 UPDATE: The removal of the letters was completed this morning without a hitch. A 10-year-old boy was accidentally shot while sitting inside a SUV Saturday night in Darby Township. It happened around 10:30 p.m. in a parking lot on the 1400 block of Calcon Hook Road in Sharon Hill. The boy and his sister were sitting in the car waiting for their father to get off work when the child found a .357 magnum in the car. The children were dropped off at the auto repair business by their mother on her way to work. The boy pulled the trigger and accidentally shot himself in the face. It entered his jaw and exited the back of his head. The boy was rushed to Mercy Fitzgerald Hospital where he was revived. He was then airlifted to Children’s Hospital of Philadelphia in critical condition where he remains. The district attorney has not indicated what if any charges may be filed. Michael Grant aka “Philly Jesus” was placed under arrest on Friday in LOVE Park where he can usually be found spreading his peaceful message. He was charged with disorderly conduct and failure to disperse. Grant has long brown hair and a beard, wears a robe and carries a staff. Earlier in the day he could be seen skating at Dilworth Park's new ice rink. People will sometimes ask to take a photograph with him. He does not charge but he will accept a tip. On Friday, an officer accused him of solicitation and told him to leave. Grant did not go because it was "an unlawful order to leave a public park." That prompted the officer to arrest him. Grant's lawyer says those are charges “the government uses when you don't do what the government wants”. Grant thinks that officer remembered him from his days as a homeless drug addict who would panhandle in the subway. Those days are in the past for Grant, according to his lawyer.